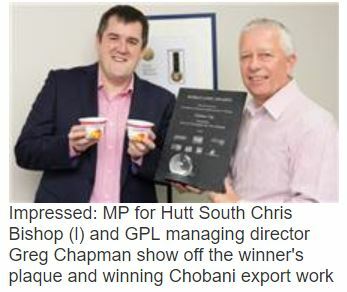 Gravure Packaging (GPL) - Packaging Council of New Zealand Inc.
Gravure Packaging (GPL) has celebrated its success in the recent World Label Awards competition, where it took out the Gravure Process Category. Greg Chapman, managing director at GPL, says, The World Label Award is great recognition of the development work invested in improving the firm’s print quality as well as its capabilities to solve what were quite technical challenges in this particular job. The World Label Awards requires entries to have won an award in their local association’s competition. It does not accept entries from individual printers. The GPL Chobani shrink sleeve won two gold medals at the Pride In Print Awards last year, including the Gravure Category. Chapman says, The New Zealand label association SALMA selected it as the sole submission it was permitted to make in the World Label Awards Gravure Class for the year. A truly international competition, its receives submission from regions such as Europe, the United States, Japan, India, China, Australia and of course, New Zealand. The second-placed entry in our class was a Heineken label from the United Kingdom.